Sharp showers lashed Kolkata on Saturday evening...Dum Dum recording 86 mms in 12 hrs ended 8.30 pm, out of which 70 mms was in 3 hrs after 5.30 pm. Scruz has also maneged 86 mms in same 12 hrs, while Jabalpur measured 33 mms. Rainfall from 8.30 am - 5.30 pm IST Saturday: Bhimashankar 100 mms, Dahanu 97 mms, Khandala 75 mms, Mahableshwar 70 mms, Mumbai Scruz 71 mms, Colaba 34 mms, Aurangabad 10 mms. Hissar 6 cms, Malda 5 cms, Seoni 4 cms. 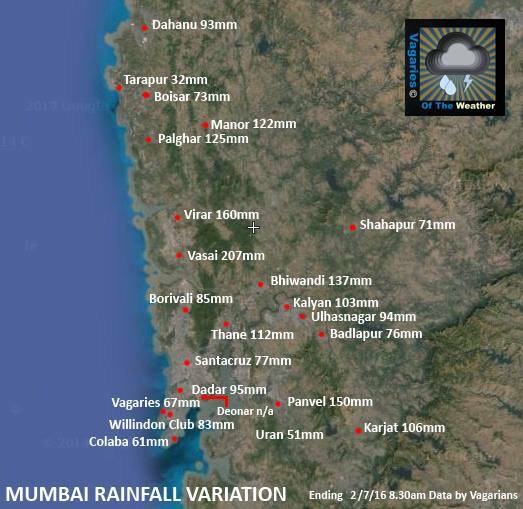 Vagarians report: Borivali 97 mms, Dadar 92 mms, Vagaries (South Mumbai ) 61 mms. Rajesh sir,extrrmely heavy rains in my town ,nagothane(can you please spot for nagothane located on banks of river amba on NH-17,around 18kms from roha.zoom the google map you would spot my place),floods are leading to disruption in normal life.whats the forecast for nagothane ,if you find it on the map ,so instead of roha you can just forecast for nagothane.Thanks in advance.Hope you will definitely not have any difficulty while pointing nagothane. There are some super heavy spells in Eastern suburbs of Mumbai since the last 4 hours now. Hope these find their way to the lake areas. Any updates so far ? How are other parts of Mumbai ? It seems Mumbai is repeating July 2014 -> Torrential rains brought > 1500mm in July month itself. Raining with blasting noise,wind,chill.. Rain is more intense compared to last week. Soon entire Mumbai may be flooded. .....as monsoon moves north southern india may enter into quiet mode. But below link shows scary brown mass over Mumbai! Heavy rain in santacruz. And it's continuously raining. Pouring here in Kandivali Lokhandwala. Roads flooded for the first time this season. rain rain and rain here from friday morning. Very heavy rainfall in Mira Road, North Mumbai from past couple of hours..i think it has exceeded 100 mm already..!! sir, what is forecast for Nashik Igatpuri and Trimbakeshwar region? Any chances of good rainfall in coming days? In June Nashik recorded only 12 mm rain. There is chances of monsoon brake after 10 July? shvkumar: expecting a gradual increase in rains from Sunday.Tuesday will see some meaningful rains in Nasik region. west MP will get heavy rain? Anoop: Delhi NCR, Sunday will be cloudy with 1 or two showers /Thunder showers. I have been visiting this blog since past couple of years and find it very interesting. Enjoy reading the almost live commentary by the team. Keep it up! I stay in pune and glad to announce we had some solid rains the past 12 hours. Exactly as predicted by Rajesh. Pune gets it's first heavy rain of season & half century too.. As 74mm ending 8.30am today..
Beauty of MAHA rains -> 1 day rain will compensate for 15days of no rains! Happy MAHA Ghat rains. Hope Krishna/Godavari will flow in full splendor benefit KAR/AP. Abhijit somebody has published your Ghat figures in "Kea blog"... people are amazed at MAHA rains!